Do you remember going on an awkward first date? Were you getting anxious meeting that person, hoping they are the one for you or do you put out? Well, look no further than First Date the Musical. 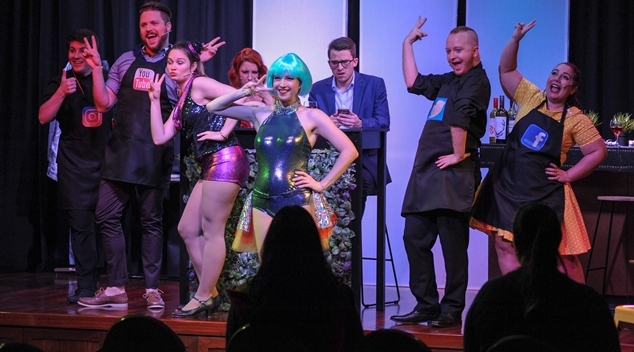 First Date the Musical is an irreverent musical comedy by Grey Lantern Productions about the two individuals in a New York restaurant meeting on a blind date and their interactions with surreal musical numbers. It was a relatable story about dates and every musical number was very gleeful with a lot of humorous lines and production. I was in awe and in laughter, as the show went on with their terrific acting and upbeat, funny musical. Not a beat of this show is boring. It was entertaining to watch and every character have their own story arcs. Each of the actors, besides the two leads, were doing multiple characters on stage, which impressed me on how they have effortlessly changed roles. I find the leads, Aaron and Casey, to be very relatable to the current modern dating scenarios as there is always a person who is a serial dater and one that rarely dates. Whichever side you are on, you will find that each of your worries could be reminiscent of your own dating life. Austin Winberg, Alan Zachary and Michael Weiner’s writing and lyricism was hilarious and touches on every aspect on the current struggles of modern dating. The added level of surrealism added a perspective on what goes on their minds and added a comical touch to an almost complete failure of a date. The waiter’s many roles manage to always steal the limelight with his magnetic yet jovial performance that reflects on his many talents. Casey has a wonderful singing voice that I could listen for hours on end and it was like she came out of a Disney princess movie. Aaron was a very believable, fully realised character who added lively touch a man who is a blind date virgin. Alison’s cold-hearted, distant yet manipulative character had me scared for once and as relatable to my own past experiences and her other many roles got me laughing hard, especially the Google scene. Lauren mesmerised me as a talented dancer who can crack a joke or two about being married early and nagging her younger sister about her terrible exes. Gabe gave a stellar performance as Aaron’s brother and his other roles, but I did notice that somehow he had forgotten some parts of the choreography. Lastly, but nonetheless hilarious Jewish grandmother gave a hilarious number about wanting a Jewish wife for Aaron and loved her background character as the single lady waiting for her date was crack up. My favourite part was the Google scene, where they had talked on how the lead characters, Casey and Aaron, did search for each other prior to meeting. It was a scene where I did relate to a lot when I went on my own date to find out about the other person. Overall. I did enjoy the show and would recommend to see it with a friend or your significant other. It is very relatable, fresh and most of all, hilarious musical that you would not want to miss! First Date the Musical is only on for a few more nights! Head to fringeworld.com.au for more information.